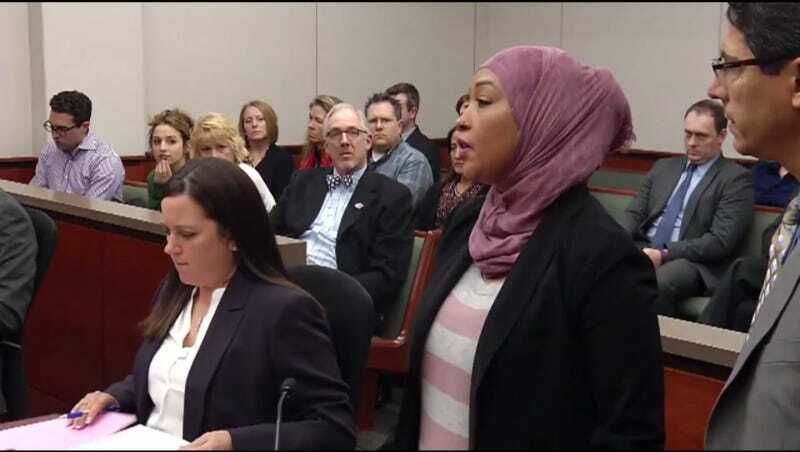 A Muslim woman who was hit in the face by a drunken, hate-filled stranger for speaking Swahili with her nieces and cousins in an Applebee’s last year managed to forgive her attacker, telling her in court, “I hope you choose love over hate.” Asma Jama’s lower lip was split in two during the assault by Jodie Burchard-Risch; she also sustained cuts to her nose and right eye, and still has scars. Authorities say that’s when Burchard-Risch hit Jama in the face with the glass mug. “They looked like just a normal couple that were having dinner and having fun and having drinks,” Jama said. Burchard-Risch wasn’t charged with a hate crime since in Minnesota, the penalties for third-degree felony assault are, somehow, more stringent. When given the opportunity to address her in court, Jama patiently explained to her that violently attacking strangers is wrong. According to CBS, her attorney said that the woman isn’t a “lunatic” or a “racist,” but someone with an “alcohol problem.” Burchard-Risch, meanwhile, had nothing to say, either to Jama or to the court. It shouldn’t be incumbent upon Jama, the victim of a heinous crime, to forgive her attacker, but somehow that often seems to be the case. She’s also become an advocate for stronger hate crime laws in Minnesota and testified in favor of them earlier this year.